This is the first edited collection to bring ecocritical studies into a necessary dialogue with postcolonial studies. By examining African, Caribbean, Pacific Island and South Asian literatures and how they depict the relationship between humans and nature, this book makes a compelling argument for a more global approach to thinking through our current environmental crisis. Turning to the contemporary production of postcolonial novelists and poets, this collectionposes the literary imagination as a crucial to imagining what Eduoard Glissant calls the "aesthetics of the earth." The collection is organized around thematic concerns such as the relationship between culture and cultivation, arboriculture and deforestation, the lives of animals, and the relationshipbetween the military and the tourist industry. 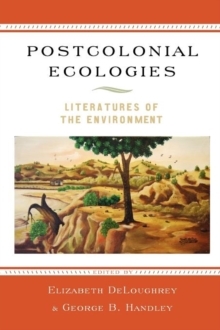 The scholars collected here are at the forefront of the emergent field of postcolonial ecocriticism and this book will make a remarkable contribution to rethinking the environment and its representation in the humanities.